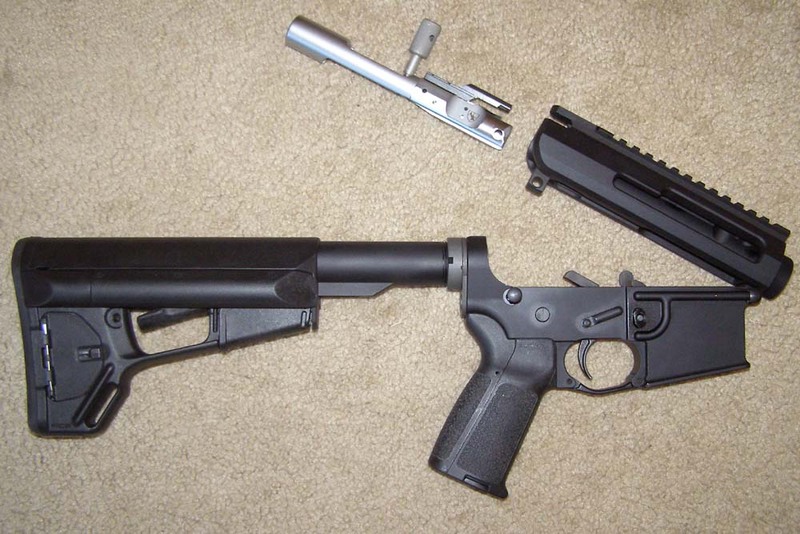 ﻿ HuntingNut » Forums » Firearms, Shooting & Reloading » Gun & Firearm Discussions » New AR Build! Posted: Mon Sep 27, 2010 5:06 pm Post subject: New AR Build! fnuser got me thinking about different cartridge options available for AR-15 other than .223/5.56. I spent a lot of time looking at all the options including wildcats. Finally decided enough was enough and started moving forward with the good old .223. Ammo cheap and easy to reload unlike some of the higher power wildcats plus there are several events in our area that are .223 only. shrpshtrjoe, got me thinking 24-in varmint from Rockriver. Then Dawgdad , the expert .223 long-range shooter, got me considering White Oak Armory. So, I finished assembly of my lower that I've had since Christmas. Got a new MagPul ACS stock. Ordered a heavy-duty "Beefy" upper receiver from Alexander Arms with a side charge handle and a WOA 24-inch flute varmint barrel with 1:8 twist. Been waiting and waiting for the UPS truck to bring the upper receiver today. Came home early from work, no truck. Mowed the front lawn, no truck. Ate dinner .... finally came! Boy is it beefy!! Here it is next to my M&P. 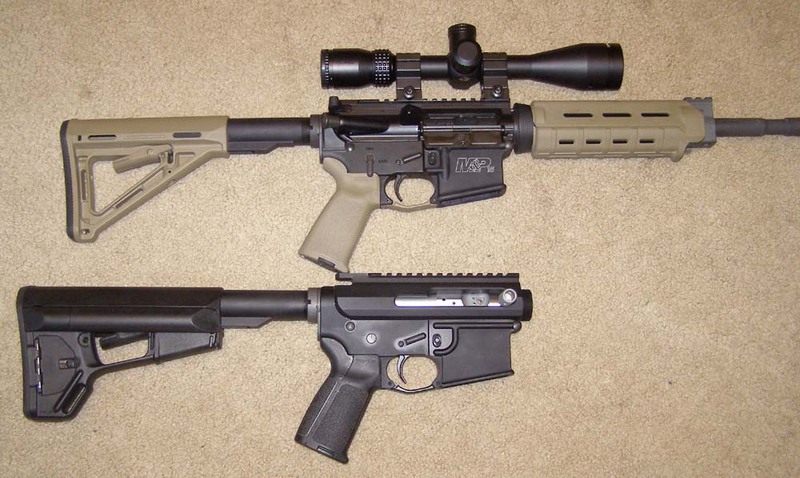 Wow, is the ACS stock longer than my other MagPul collapsible stock! Posted: Mon Sep 27, 2010 5:08 pm Post subject: Re: New AR Build! Here is the receivers side-by-side. Look how much more metal is on the Alexander Arms receiver! The bolt release is significantly recessed and note how little vertical side there is going up to the top rail. Also, at the buffer tube, the standard upper flares in while the Alexander Arms bulges out. Where's the Beef!! Posted: Mon Sep 27, 2010 5:09 pm Post subject: Re: New AR Build! Posted: Mon Sep 27, 2010 5:10 pm Post subject: Re: New AR Build! One last picture for today. WOA Barrel is still at least 3 weeks out. Posted: Mon Sep 27, 2010 5:58 pm Post subject: Re: New AR Build! Looks pretty good! Can't wait for some shooting reports! Posted: Tue Sep 28, 2010 6:40 am Post subject: Re: New AR Build! Posted: Tue Sep 28, 2010 8:00 am Post subject: Re: New AR Build! fnuser got me thinking about different cartridge options available for AR-15 other than .223/5.56. Here it is next to my M&P. ! Nice MP bud, like the Coyote color. I wanna black rifle but way outta my price range for now. Ca is trying to ban them too so...law says if it has a pistol grip it's supposed to have a fixed mag. Or some such. Posted: Tue Sep 28, 2010 8:21 am Post subject: Re: New AR Build! Posted: Tue Sep 28, 2010 1:47 pm Post subject: Re: New AR Build! Posted: Tue Sep 28, 2010 7:09 pm Post subject: Re: New AR Build! Dig that beefy charge handle. Does it ride along or is it idle while firing? 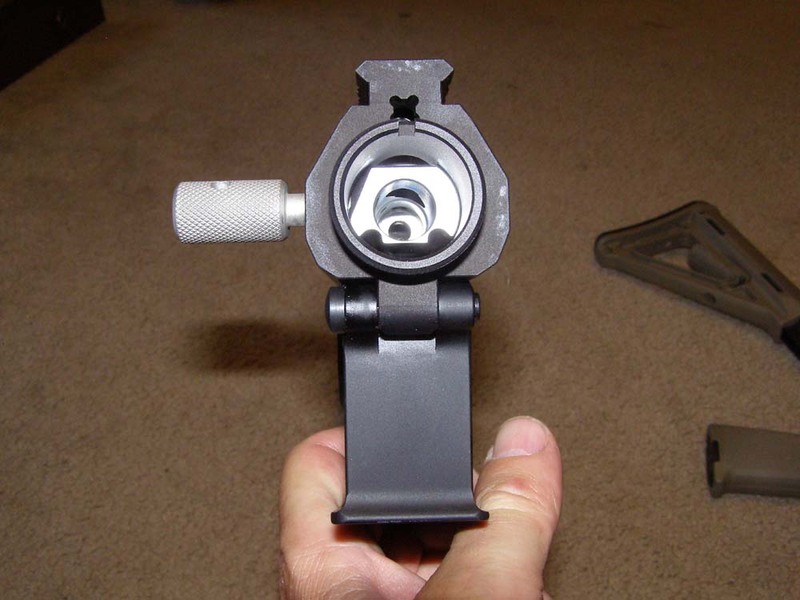 This side charge handle rides along with the bolt, just like an M-1, M-14, or Mini-14. There are some that are idle on the left-hand side or just under the flat-top. This was my choice as it has the beefed up receiver and I can directly control the feed when I manually cycle. There is something about the rebated rim on the .50 Beowulf that keeps me looking toward the .450 Bushmaster or .458 SOCOM. .450 Bushmaster fits in a regular upper and they are developing some significant power with it. .458 has great bullet selection and brass selection. .450 comes with a chrome barrel which I really like. Posted: Tue Sep 28, 2010 7:12 pm Post subject: Re: New AR Build! I wanna black rifle but way outta my price range for now. Ca is trying to ban them too so...law says if it has a pistol grip it's supposed to have a fixed mag. build them one piece at a time over several months so you can spread the cost out. That's what I have to do to win approval of the "banker". You can get stocks that are "thumb" hole and not considered pistol grips to eliminate the magazine issue. Posted: Tue Sep 28, 2010 10:13 pm Post subject: Re: New AR Build! I've thought hard about the .458 SOCOM as is uses the same bullets I already use for my .45-70s. 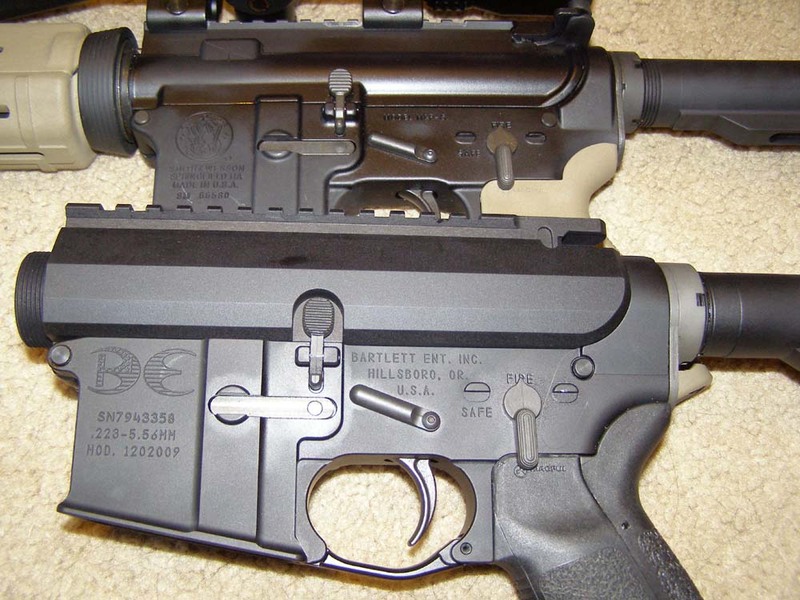 Posted: Wed Sep 29, 2010 1:42 am Post subject: Re: New AR Build! That stock doesn't look very comfortable to use at all. I like the thumbhole stock. Here is one on a Remington rifle. Posted: Fri Oct 01, 2010 6:22 am Post subject: Re: New AR Build! I like not rushing things and taking them one step at a time. That has been part of the fun of building this rifle over a couple of months. 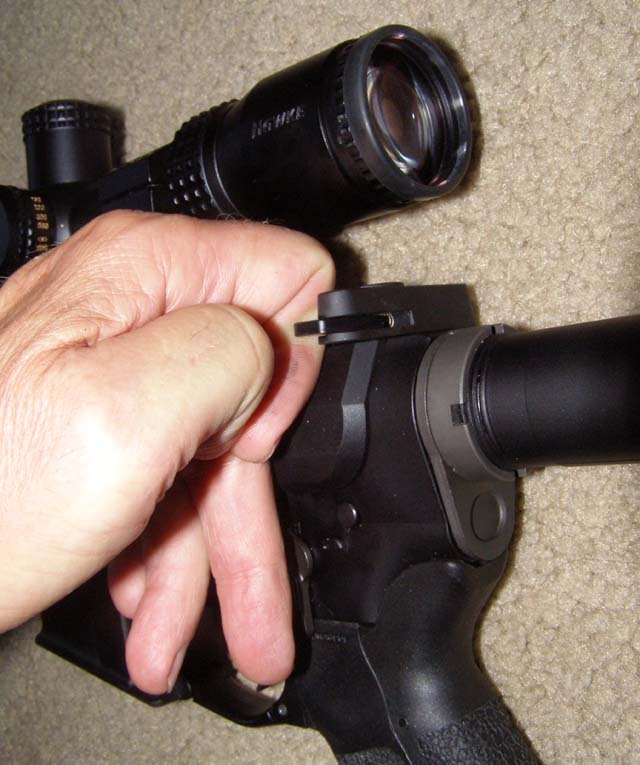 I have no trouble using the standard charging handle on my M&P with a scope. Thought I'd better try it with this new heavy-duty receiver. Not surprising, I could not get my knuckle in to hook the charge handle like on the standard receiver. I know I have the side charge handle but I'd still like the standard charging handle to be usable. Looks like I'll have to investigate some of the tactical extensions. Recommendations? Posted: Fri Oct 01, 2010 7:33 am Post subject: Re: New AR Build! There are a couple of different versions.